NEW DELHI, India (CNN) -- A train carrying Rahul Gandhi, the heir apparent of India's ruling Congress party, was pelted with stones Tuesday night, police said. 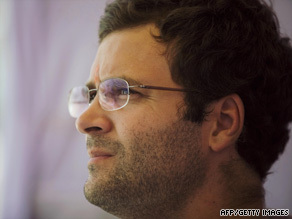 Rahul Gandhi, the heir apparent of India's ruling Congress party. Gandhi was traveling on one of India's Shatabdi Express trains -- fully air-conditioned, speedy trains preferred mostly by India's wealthy and upper-class travelers. Gandhi's train was hit by stones -- and at least two windows were broken -- as it passed through a village en route to the capital of New Delhi from Punjab state, a spokesman for Haryana state police told CNN. The police spokesman, S.A.H. Zaidi, downplayed the attack on the train, insisting it was not aimed at the 38-year-old Gandhi, one of the most protected people in India. "Maybe some children just hurled stones. His (Rahul Gandhi's) coach was not hit. There was no injury," Zaidi said. But the stoning attack came as the Congress party, headed by Rahul Gandhi's Italian-born mother Sonia Gandhi, is trying to convince voters that its top leaders are cutting costs on their travel. The move, dubbed "austerity," comes in the wake of news reports that both the Indian foreign minister and his deputy had been staying in luxury hotels since their inauguration earlier his year. The two ministers -- the junior one a former U.N. under-secretary-general -- claimed they paid the hotel bills from their own pockets. Nonetheless, they had to move out of their hotels apparently under pressure from their party, which faces elections in three key states next month. In India, many of the country's lawmakers are perceived by some voters as living lavish lifestyles. A number of them refuse to vacate their sprawling government villas despite losing designated positions. With elections looming, Congress party leaders including Gandhi have launched the austerity drive, citing crippling drought in many parts of the country. Gandhi, widow of slain former prime minister Rajiv Gandhi, traveled economy class on a state-run Air India flight Monday, with her body-guard contingent accompanying her.